Page from Hartmann Schedel's Liber Chronoicarum showing Regiomontanus holding an astrolabe. Image by kind permission of the Master and Fellows of Trinity College Cambridge. 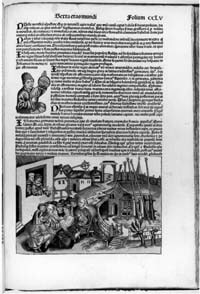 According to the Liber Chronicarum (Nuremberg, 1493) of Hartmann Schedel, Regiomontanus' fatal trip to Rome in 1476 was prompted by the summons of Pope Sixtus IV, who wished to engage the astronomer in a reform of the calendar. This story is rendered plausible by the fact that Cardinal Bessarion, Regiomontanus' former patron, had raised the matter of errors in the calculation of the date of Easter with the former pontiff, Paul II, in 1470, in all probability relying upon a tract which Regiomontanus had written on the topic during his time in Rome. 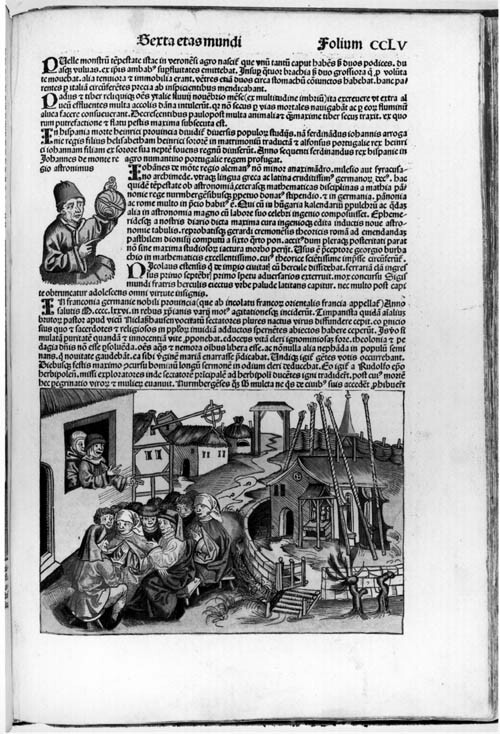 It was most likely this work which Regiomontanus proposed (in his 1474 tradelist) to publish in Nuremberg. The issue of calendar reform was also raised in Regiomontanus' calendars for 1475-1531. Here he pointed out that errors resulted from incorrect assumptions about the length of the year and the changing lunar phases, and named 30 instances between 1477 and 1532 when the ecclesiastical calculation of the date of Easter and the correct date would differ. Perhaps in recognition of the sensitivity of the topic, this section was only included in the Latin version of the calendars and omitted from the German edition issued at the same time.